Reed Barton Sterling Francis First Nativity Ornament Set. 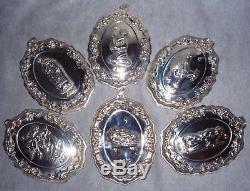 Complete collection of all six editions in the Francis I Nativity Series of sterling silver ornaments by Reed & Barton. Each edition depicts a beautiful nativity scene enhanced by design elements inspired by the popular Reed & Barton Francis I sterling silver flatware pattern. Each ornament is dated with the year of issue. These are all in as new condition. Each comes in the original tarnish resistant pouch and clam shell box along with most romance cards. These lovely ornaments are large sized, approximately 4 inches long and 3 inches wide. May be a few very light polishing abrasions or scratches on the flat back from display. Premier Edition Herald Angel Second Edition The Shepherd Third Edition Three Kings Fourth Edition Mary Fifth Edition Joseph Sixth and Final Edition Christ Child Great gift for your favorite pastor, secret pal, divinity disciple or just you! Super addition for a "Meaning of Christmas" themed tree. 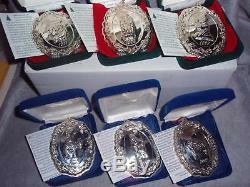 As a result, the following series are no longer in production: Sterling Angel, Santa, Williamsburg and Pierced Cross as well as the Silverplate Cross and Snowflake. The Lunt label has been totally eliminated. If by some small chance your item is not satisfactory, your return should still be received within 7 days or less. 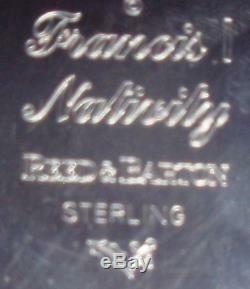 The item "Reed Barton Francis 1st Pattern Sterling Silver Nativity Christmas Ornament Set" is in sale since Tuesday, January 24, 2017. This item is in the category "Collectibles\Holiday & Seasonal\Christmas\ Modern (1946-90)\Ornaments\Metal".